In this lesson, we will learn how to find areas of composite shapes including shapes made from squares, rectangle, triangles, and trapezoids. Calculate the area of the shape. 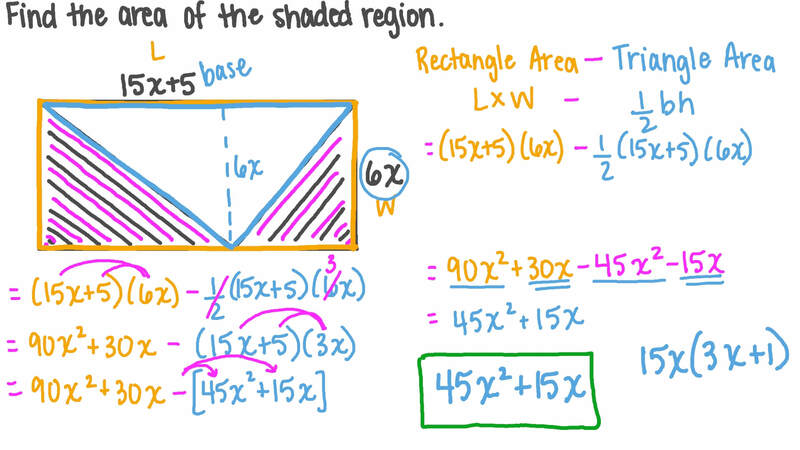 Calculate the area of the shaded region. Find the area of the given shape. Below is a square which has had a rectangle measuring 4 cm by 3 cm removed. Find the area of the shaded part. If 𝐸 𝐹 = 4 . 5 c m , find the area of the given figure to the nearest hundredth. Below is a rectangle which has had a square of length 2 cm cut from it. Find the perimeter and area of the remaining shape. A Perimeter: 46 cm. Area: 100 cm2. B Perimeter: 100 cm. Area: 46 cm2. C Perimeter: 40 cm. Area: 100 cm2. D Perimeter: 34 cm. Area: 100 cm2. Karim wants to lay a new carpet in his bedroom. Determine the total area that needs to be carpeted, given that the shown figure is the floor plan. Given that 𝐴 𝐵 𝐶 𝐷 is a square of side 6, what is the shaded area? The triangles in the figure are all congruent. Determine the area of the figure. Find the area of the given figure to the nearest hundredth. Write the algebraic expression that represents the area of the given figure in square centimeters. Work out the area of the composite shape. Ramy is laying a new path all the way around the edge of his yard. Look at the diagram to figure out the area of the grass section. AThe area of the grass section is 160 m2. A school is laying a new floor in the cafeteria. The eating area measures 42 feet by 9 feet and the cooking area measures 12 feet by 7 feet. How much flooring will they have to order? (Your answer should be given in square feet). Work out the area of the shape. Calculate the area of the grey part. Determine, to the nearest hundredth, the area of the trapezium 𝐴 𝐵 𝐶 𝐷 .